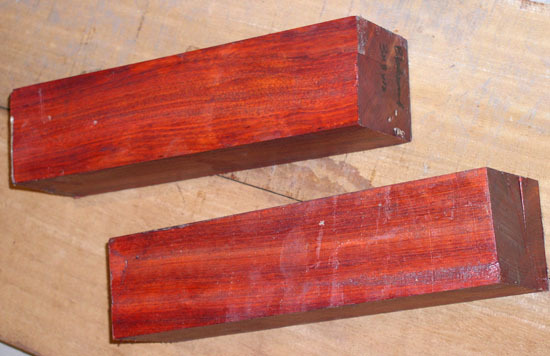 Bloodwood can be the reddest wood out there without resorting to a bottle of dye. It has a pleasant smell when turned and is very dense. The specific gravity can vary from .7 to 1.0. The wood we sell tends to be on the higher end of density. It is native to Brazil and other areas in South America. When sanding, be careful not to overheat the piece or cracks could result. If a tiny check appears, we immediately fill it with superglue, and there is no visual evidence of the check afterwards. Photo above is of DARK grade. Note that when we say "air dried" or "kiln-dried" we mean that the wood has been properly checked with a corrected moisture meter and is known to have less than 12% moisture. 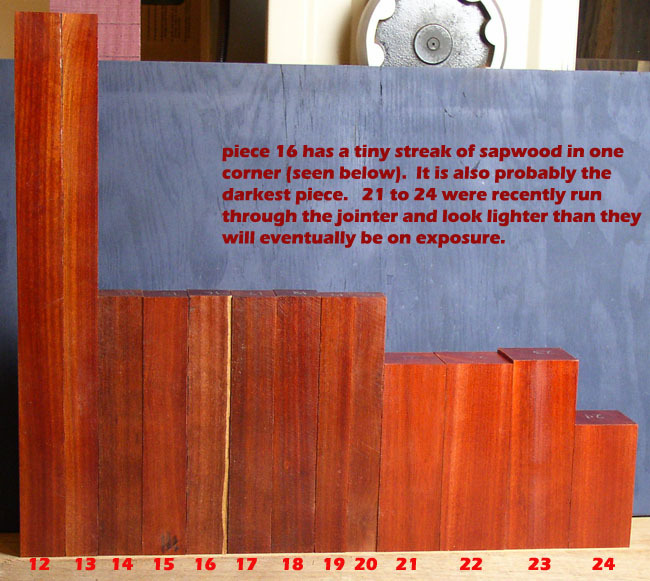 12% moisture is what used to qualify as a kiln-dried piece of wood in the past. 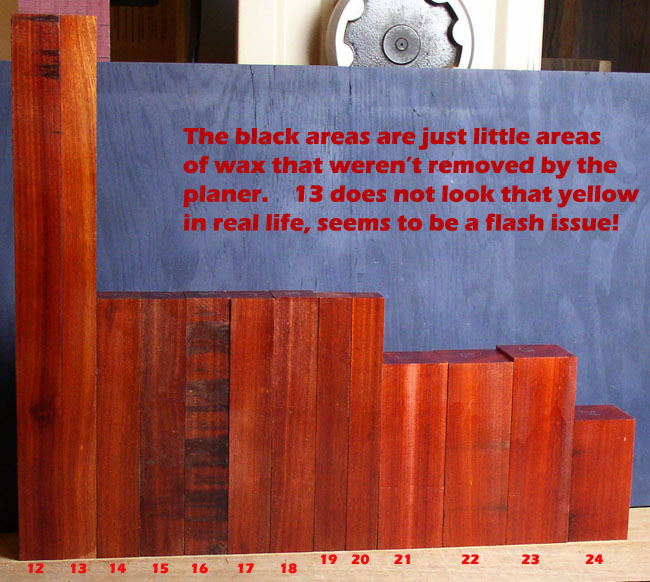 Unfortunately, many vendors have started using using up to 18% moisture (which is unstable) to count as kiln-dried and completely wet wood to count as air dried. We don't make claims of "air dried" or "kiln-dried" unless we know the actual moisture and it is genuinely under 12%. 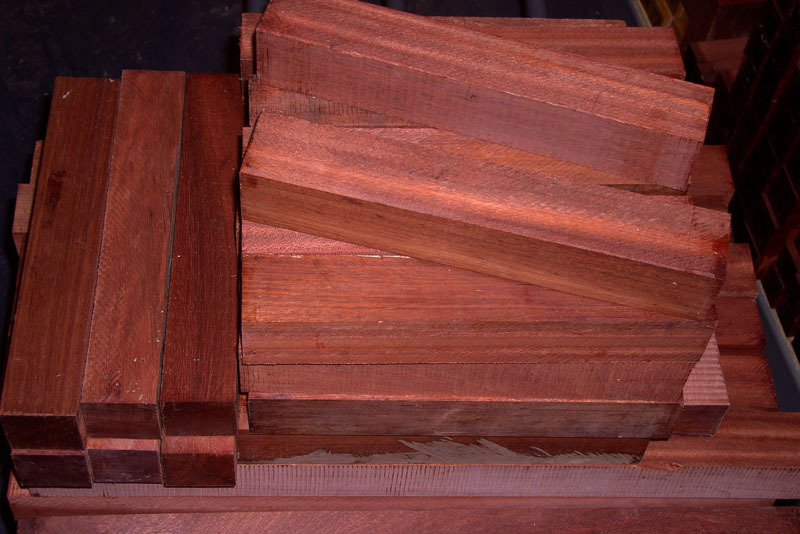 HOW WE GET TOP QUALITY: Bloodwood comes in a variety of shades from brownish to cranberry red (pictured here). 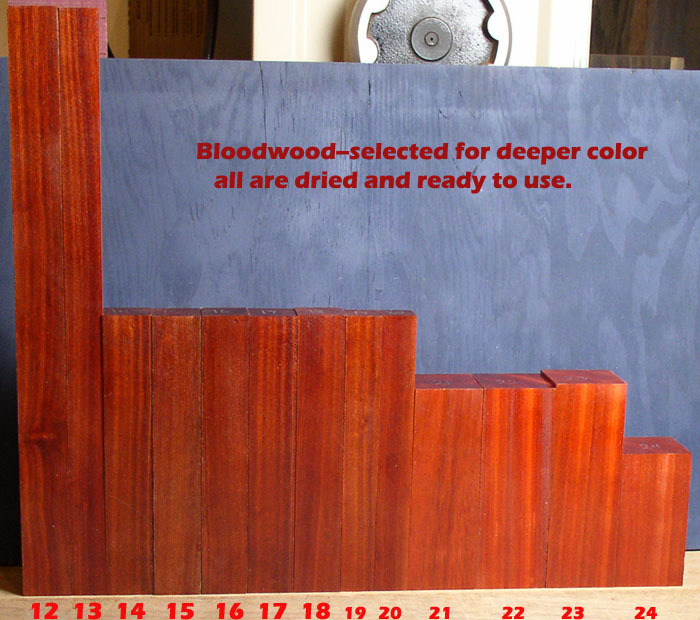 Because of the fact that most bloodwood isn't as dark as it used to be, we are seperating wood into two categories of medium dark to darker reds= (DARK) and light to medium reds= (MEDIUM). 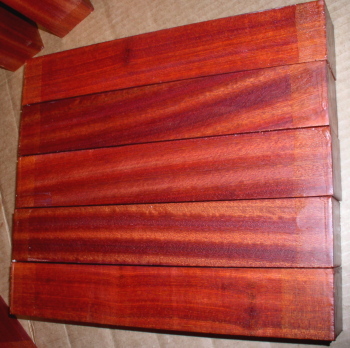 Our bloodwood is kiln-dried in the 1" thickness. Pieces above 1" thick are partially air dried and cut very cleanly with no checks or cracks, unless specifically noted as air dried. 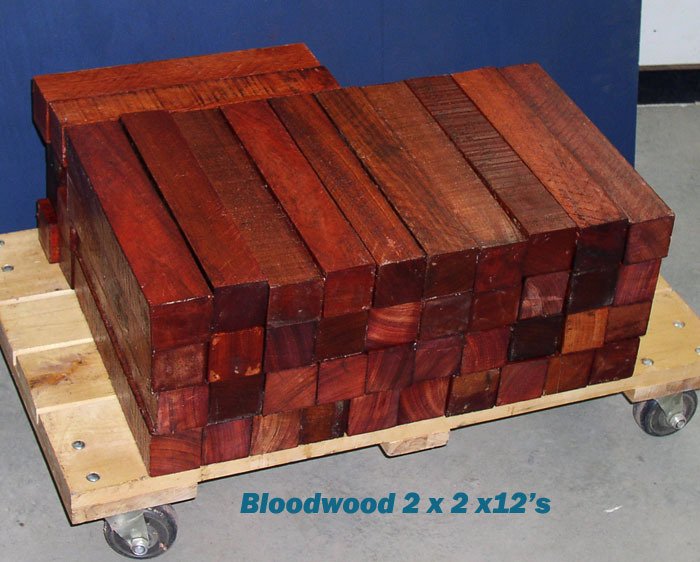 We have found that over 1.5" bloodwood cannot be kiln-dried without checks appearing on the inside of the wood. 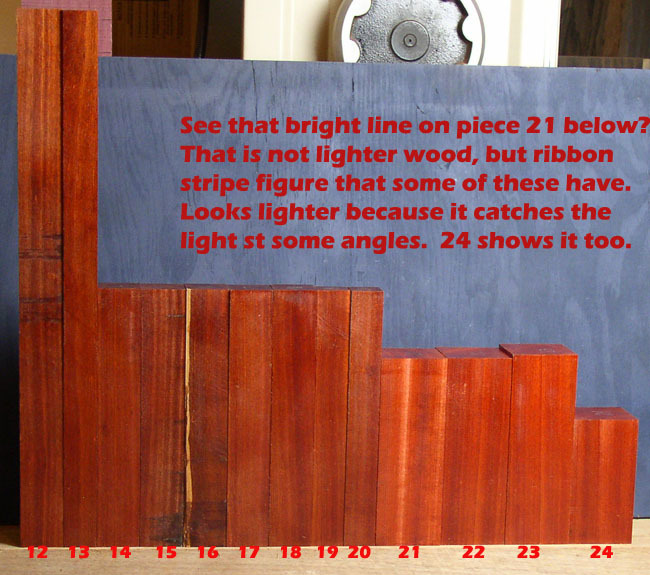 This is why we have switched to non-kiln dried wood in pieces above 1". Each piece is high quality and has color according to the new grading system. limited stock, very hard to get now! Shown in bare wood after removing any wax. Colors are richer after finishing. You may receive some of them partially waxed. They are waxed in Brazil beyond our control and they usually now have wax on the blank, but they are now DRIED (whether waxed or not) ! Nice color in these. The above are a some of the actual pieces for sale. Pick these for best price, sent partially dried and waxed, just like you get at big catalog sellers, but at a better price! When you compare apples to apples, our prices are lower. 15% off the lowest price we could find online for the exact same item! . Nice color in these. The above are a fair sample of what you'll get for color. Sample of color seen in squares and bowl blanks sold below. SECONDS for checks/some cracks, 40% off! Sample pic showing some of the pieces for sale. Good reds, no yellow stripes, dried completely over 5 years. Sent cleaned up and finished with shellac, just like in the picture above. Some have ribbon stripe figure, some don't. Can pick for figure if we have it when you order and you request it. These pieces have been dried about 5 years. 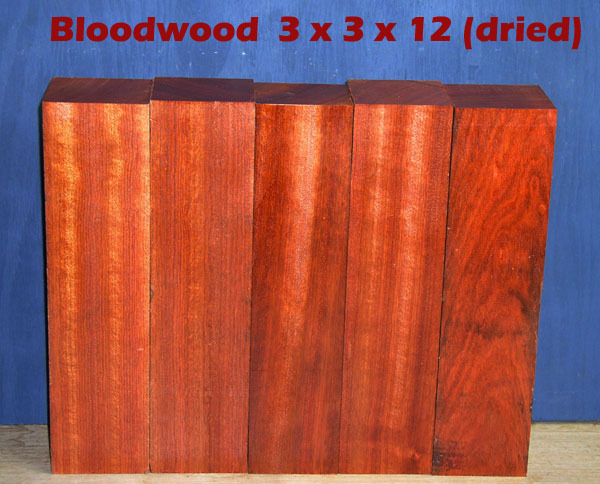 It is almost impossible to find 3 inch thick bloodwood for sale anywhere that is dried and defect free like these pieces. Pieces not shown below are sold. Many pieces were lost during the drying process. We prefer to give you something ready to use when possible, as it is very frustrating to get wet waxed pieces that won't dry in your shop properly. Before I had my own business I used to get pieces like that from various companies, and had no idea how long and hard it is to dry 3 inch exotics. I ruined many of my pieces back then and decided that I didn't want that to happen to my customers. Notes; all pieces marked below as 3 x 3, a couple might be as small as 2 7/8 square and some are just over 3 inches square. 2 sides shown, other sides similar. No yellow striping on any sides. Some have ribbon stipe figure, which is identified in the photos where present. SHIPPING HINT: You can fit up to 4 pieces 3 x 3 x 13.25 in one medium flat rate box(3 pieces if shipping outside the USA). Actual pieces for sale shown, order by number below. Notes: These are selected darker pieces, very tough to get these now. The only way to get these is to hand pick certain small red sections of boards. Normal bloodwood boards are not very red anymore. The reason is that around 2011 Brazil stopped allowing cutting in the areas where the deep red ones grow. So these are primo and carefully selected for color. Notes: 21 to 24 were recently cut and will darken soon to a deeper shade.